A lot of goalies buy overdrive because they want the added mobility while down that the blade offers. Naturally it is disappointing when their expectations are not met and they have trouble getting any movement at all. The first reminder should be that these moves take time and effort to learn. I've said all that before and I'm sure you know it so instead, I'd like to focus on what can go wrong. Once you are aware of these problems, it'll be easier to correct them and get these moves moving. There are also 4 separate Flash movies linked here which look at various aspects of these moves. I used the latest Flash because it handles video so if you don't have the Flash 6 plugin, it won't work. 98% of net users have Flash and it's hard to go anywhere without it. It's a one minute download at Macromedia. Please note that none of these movies have preloaders so they'll take a minute to get off the ground. The main reason goalies don't get the mobility while down is because their weight distribution on the sliding leg is wrong. Moves while down may look different, they are essentially all the same; you lift one leg and use it to push across. The leg that slides out must lighten up so that it can slide, while the pushing foot takes all the weight to power the move. What usually goes wrong is that the sliding foot doesn't lighten up enough so it's too heavy to move. As a result, the pushing foot doesn't get enough weight on it so it blows out, even with Overdrive on. The crucial moment comes in Frame #2. At this point there must be minimal weight on my left leg. The weight must have shifted to my right leg so that it can plant securely and power the push. If at this point all my weight was on my left leg then the right foot would blow out. Only when you have lightened up on the sliding leg will it be able to slide out. Movement is all about throwing your weight around so from Frame #2 to Frame #4, I throw my weight from my right leg onto my left leg. The momentum of the move then carries me further. So let's take a closer look at this 'crucial moment'. In order to push, the pushing leg must be angled up. 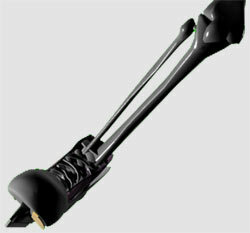 On the sliding leg, although the pad may be on the ice, your knee should be up with almost no weight on it ('A'). Similarly at the foot ('B'), you'll be on the side of your boot but with very little weight on it. So the problem is that as awkward as this may sound, it's much worse if you haven't tried it before. Fear not, there is a way. What you'll have to do is incorporate a quick, subtle hop to get that weight off the sliding leg and over to the pushing leg. Remember that this is a one-legged hop; only the sliding leg briefly lifts. If you have to, imagine that instead of sliding over, that pad will glide across an inch above the ice. With the repetition of practice, you'll use less and less of a hop until eventually it will be very hard to detect. That's really all there is to it and now that you know, you just have to go out and repeat it several thousand times. Don't gag. It's very easy to do 50 reps so after 20 sessions you'll be close. The other problem you can have is an insufficient push. These moves require a lot of power so you'll have to really load up the pushing foot, especially when the ice is rough at the end of games. You load it by raising the leg and bringing it into the body. On the strip below I get my leg up quite high and there's also a bit of twist thrown in. My upper body turns right as the left leg flares out a bit. I recommend that you practice this move. Try getting the leg up to various heights, add in some twist once in a while or try keeping your arms in position. Raise the leg high enough to get a good grip with Overdrive and throw in a full push once in a while. This move will have to be very fast if it's going to be useful so get it smooth and then speed it up as much as you can. Bringing the leg in and raising it loads it for a push (left) but if you want to keep the leg farther out, you can roll your ankle down to engage Overdrive (right). You won't get a big push because the leg isn't 'coiled' but you'll get something. It's a difficult move and takes a lot of practice to get and to maintain. 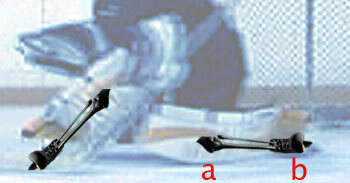 Some goalies new to Overdrive hope to get movement when the leg is horizontal to the ice; it won't happen. Do not even think of moving the blade out for these moves because in that position, the body cannot exert enough downward pressure (red arrows) on the foot to power a move. The leg must be brought in and angled up at least a bit. Work on loading the foot for the big pushes, then try a lower and lower angle. Not making full use of Overdrive is a common problem on all moves. When goalies first put Overdrive on, they often complain about not feeling enough grip. As I've mentioned before, this is because the foot used to avoid rolling into the side of the boot to avoid a slipout and now it has to do the opposite and dig in. In time the foot starts to roll into Overdrive and make use of it but, you may want to take a closer look at this. Make sure you're using all of the blade instead of just some of it because the tougher moves require you to grind your foot down to squeeze out the power. Here's a final Flash movie to take a look at the problem. So there's a quick look at moves while down. Some problems and solutions and I hope it helps.